Need a quick and refreshing side dish to add a pop of color and fresh flavor to your dinner table? 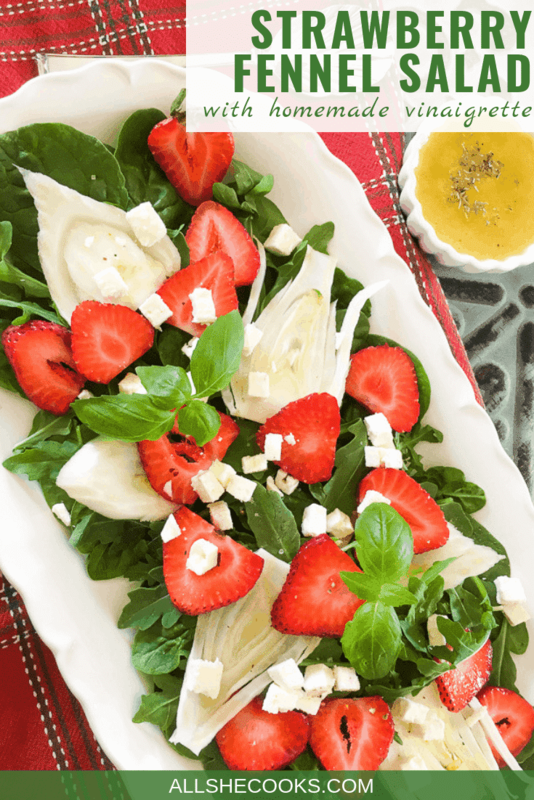 Look no further than this super quick and easy Strawberry Fennel Salad with Homemade Vinaigrette. And not only does it make a stunning presentation, it comes together in just 15 minutes. 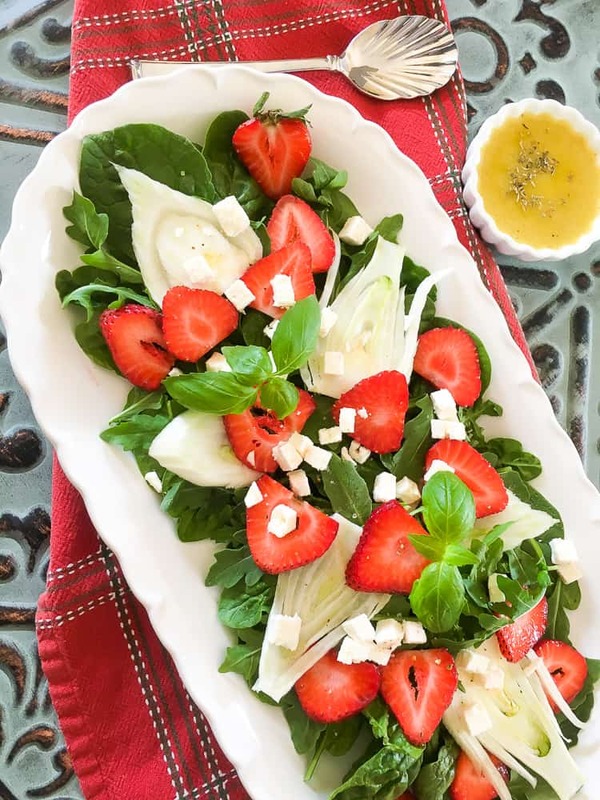 Strawberry Fennel Salad is an ideal dish for serving up on special occasions and busy weeknight meals alike. Fennel is a plant with white bulb, green stalks, yellow flowers and feathery fronds (leaves) that look similar to leafy green carrot tops. Fennel has a sweet licorice-like scent and flavor that is similar to anise. And while the entire plant is edible, the bulb is the most commonly used part. Thinly sliced raw fennel bulb adds a fresh, bright spring-like quality to salads, slaws and pastas. Fennel bulb can also be roasted or grilled, and it is also added to soups and stews. This Strawberry Fennel Salad is a deliciously fresh combination of textures, colors and flavors. The fennel offers a satisfying crunch, while the juicy, sweet strawberries balance out the natural saltiness of the Feta cheese. Healthy, hearty and super easy, this is the salad you will be making all summer long! First, prepare the vinaigrette by whisking together olive oil, rice wine vinegar, dijon mustard and seasoning in a bowl. Taste and then adjust seasonings as needed. Then transfer the vinaigrette to a serving container and set it aside. 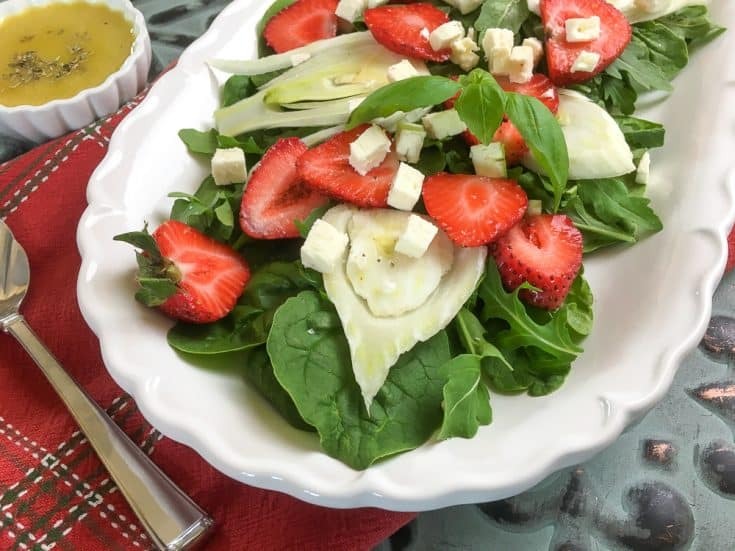 Next arrange the spinach and arugula on a serving platter and top with sliced fennel, strawberries, and Feta cheese. 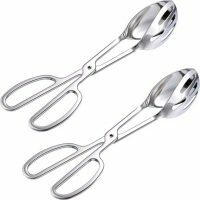 Serve by setting out the platter, salad plates, forks and the container of vinaigrette. Enjoy! 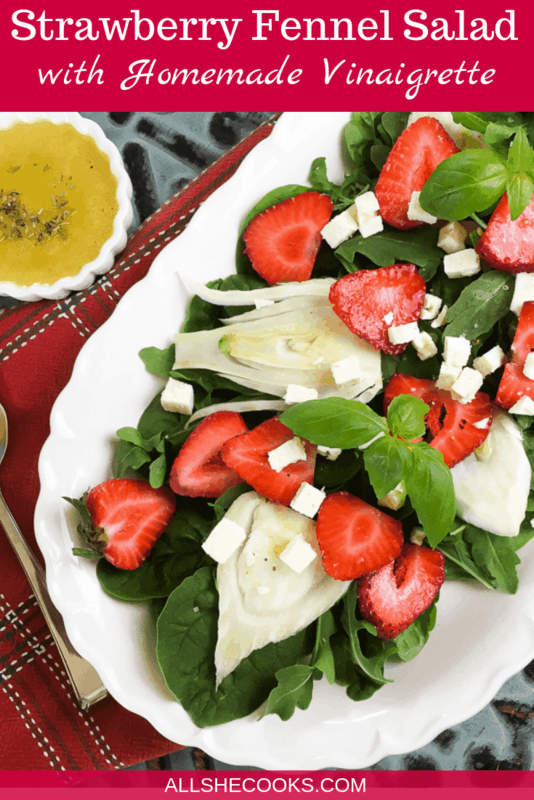 Strawberry Fennel Salad is a deliciously fresh combination of textures, colors and flavors. 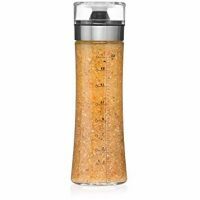 Prepare dressing by whisking together all dressing ingredients in a glass or other non-reactive bowl. Taste and adjust seasonings, as desired. Transfer to a serving container and set aside. Serve immediately with chilled salad plates and the dressing on the side.